The Daily Gem Bonus: Removed Blanket RETURNS? Hey Daily Gem fans! I can't believe they put back a deleted item! The original Blanket was put back today! 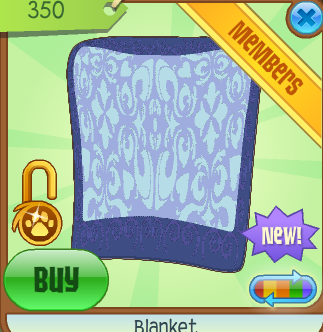 Animal jam is putting out tons of blankets. I suggest you trade your precious blankets quick! If you have a beta color of an Old Blanket, you can keep that. I doubt that'll come out again. Weird! I wonder what AJ is going to do with the Carnival? 2 days to go! Anyways, check out the new contests page! You could win roses if you get the questions right!